Taste test: Another fine chip from the people at Dakota Style. A good crunchy chip with a thicker cut, and less oil than other kettle-style chips we've tasted. 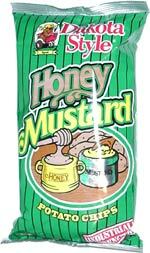 The Honey and mustard flavor is good, it's more honey than mustard but we think that's a good thing. There's also enough flavoring on each chip to leave some residue on your fingers. Smell test: Very slight mustardy aroma.